As someone who works and studies in public health, I know that what you eat, your exercise habits, nutrition - these things are all incredibly important to people's overall health and well being. But as someone with a neuromuscular disease, nutrition isn't something I'm really an expert on - I had trouble gaining weight before my feeding tube! So, I wanted to get an outside, more expert perspective to talk about these kinds of things. Liz, someone I've know for years (her sister and I have been friends since 4th grade!) actually went to school for this, so I invited her to write weekly posts here. Hi there! I am Liz, a friend of Heather’s, and I will be writing about topics concerning nutrition and well-being. I have a pretty good background in nutrition and was excited when Heather asked me to write on topics that I found to be important. So for today’s article, I want to briefly discuss nutrition labels. Take a look at these nutrition labels. The left label is one you all are probably very familiar with, whereas the right side label is an example of a new-ish, proposed design that has yet to hit the shelves. Right away you should notice two things: the letter size of “calories” and “serving size” have drastically increased. The reason for the increase is to draw the viewers eye to how many calories are in a particular serving. Believe it or not, many people are not educated on reading a nutrition label and assume that the calories listed is for the whole container. In the label on the right, you can see that in a 2/3 cup of the item, there are 230 calories in that serving size. Because there are 8 servings in the container, if you were to eat the whole container, your caloric intake would be 1840 calories (230 calories x 8 servings). The next thing that should jump out at you is the fact that under “Total Sugars” is a sub-heading of “Includes ____g of Added Sugars.” So what is the purpose of this? To help inform consumers in making healthier decisions. There are foods that have natural sugars within (think of fruits) and foods that have sugars added to them to enhance flavor (thinks of cereals -corn syrup) and consumers should be wary of items that have added sugars in them as they increase caloric intake and decrease nutritional value. You can also see that Vitamin D and Potassium have replaced Vitamin A & C. The reason for this is that more consumers tend to be deficient in Vitamin D and Potassium versus Vitamin A & C. I am so happy to see Vitamin D added to labels! I just want to take a brief moment to describe the % Daily Values, based on a 2000 calorie diet. Here is the best way to think about those numbers. Anything less than 5% is low. Anything greater than 20% is high. The nutrients you typically want low numbers in are total fat, trans fat, cholesterol, and sodium. Looking at the nutrition label above, you can see that there is a moderate amount of total fat and sodium in this food. The nutrients you typically want to aim for 20% or greater are fiber, vitamins, and minerals. Every individual has different nutrient needs which is I use the word “typically.” A person with cystic fibrosis has very different nutrient needs from a person with heart disease. 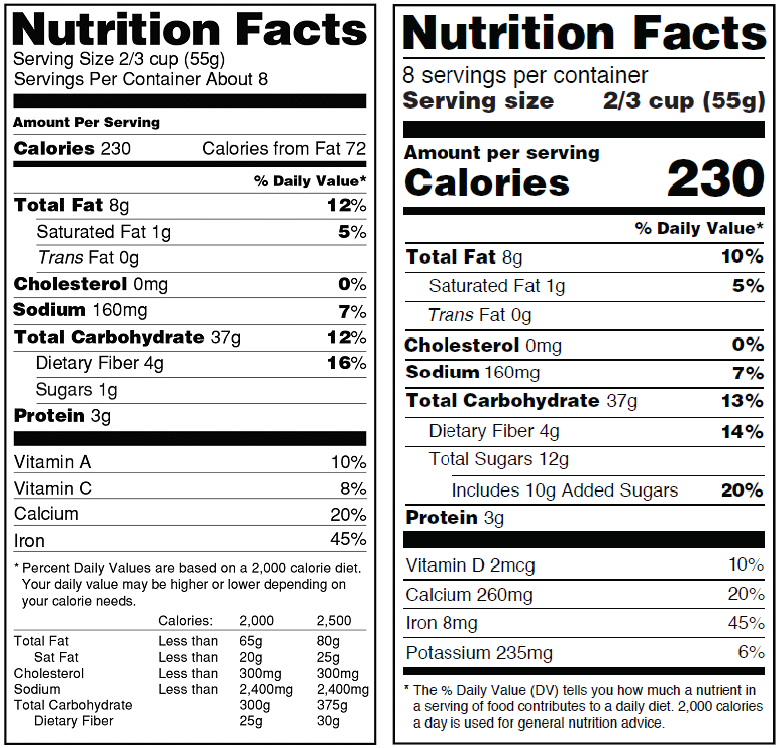 I hope you enjoyed today’s quick and brief lesson about nutrition labels and what to expect in the near future. If you have a certain topic you would like to read about, let Heather know - comment below, or e-mail her at theheatherreportblog@gmail.com!